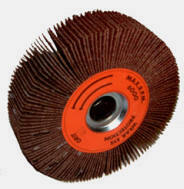 Aluminum oxide cloth flap wheels with 1" arbor holes. These wheels are typically mounted on bench grinder type tools. If you do not see the size you need, contact us us with your requirements. See bottom of table for arbor bushings. Use to convert wheels to fit your grinder. Bushings for converting arbor sizes - found at the bottom of the flap wheel cart list.